Live blog on RTÉ.ie and the RTÉ News Now App from 11am. Live and exclusive national commentary on Sunday Sport, RTÉ Radio 1 from Brian Carthy and John Casey. Live coverage on TG4, with highlights of the game, along with all the weekend's action, on The Sunday Game, RTÉ 2, from 9.30pm. 'The Dressing Room' hosted by Jacqui Hurley and Darren Frehill, with contributions from Lee Keegan, Cora Staunton, Bernard Flynn and Oisin McConville, plus a very special guest, will preview the senior final on the RTÉ Player and RTÉ News Now from 11.30am. This could be a historic match-up for more than one reason. It is the first final where participants must have been under 17 years old at the start of the year rather than under 18. Kerry could also become the first male hurling or Gaelic football team at any level to win five All-Ireland titles in a row. Their seniors were famously denied the same honour when Seamus Darby's late goal clinched an Offaly upset in 1982. 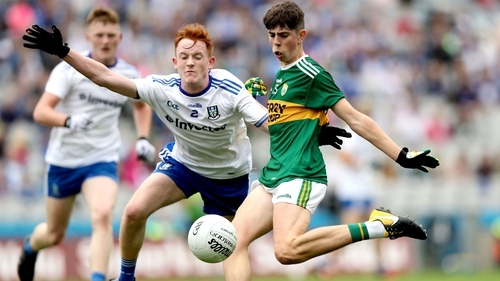 Last year's Kerry minors have already made history as the first four-in-a-row winners. Galway, beaten by Kerry in the 2016 decider, last won the trophy in 2007. Kerry will want to build on the achievements of their predecessors and maintain an incredible 29-game unbeaten record stretching back to 2014 - when the Kingdom ended a 20-year wait. However, given the change in age grades, none of last year's victorious team are on the panel, prompting manager Peter Keane to suggest that the focus on five in a row is a bit off the mark. "There's no talk by any of the players or us as a management in viewing it that way," he told The Kerryman. "These players were only 11 or 12 years old in some cases when this all began and all they want is their own medal, which is something none of them hold at present." Kerry beat Tipperary, Cork and Clare in Munster before getting past Roscommon at the quarter-final stage. They needed to produce a late surge for a narrow (1-16 to 2-11) victory over Monaghan in the last four though, Paul Walsh and Jack Kennelly kicking late points after the Farney lads had edged ahead. Galway could clinch a minor double following the success of their hurlers at Croke Park a fortnight ago. They have had to play two games more than their opponents as Connacht was run in a group format. The Tribesmen defeated Roscommon, Sligo, Mayo and Leitrim before beating the Rossies again to secure their fourth provincial title in a row. They then got the better of Clare and Meath at the All-Ireland stage, recovering from big deficits in both ties. Galway have an eye for goal, scoring 16 in 7 games, including three in the semi-final win over the Royals. Centre-forward Aidan Halloran also scored four points from play in that game while roving wing-back Cathal Sweeney chipped in with three. Manager Donal O'Fátharta is expecting another high-scoring affair this weekend. "Kerry are very similar to Meath - physically strong, play a similar type of football," he told the Connacht Tribune. "So it'll probably be an open game on Sunday and it'll be up to us to keep it tight when we need to and take our chances. "If we can do that we're in with a chance; if we don't, we're not going to keep Kerry at bay." Both sides are unbeaten and have never met so calling this one is a particularly tough task. Kerry will be hoping their superior margin of victory over Clare - 20 points to Galway's seven - is some indication of form but the destination of the Tom Markham Cup is far from decided. Galway are through to the @ElectricIreland All-Ireland Minor Football final!